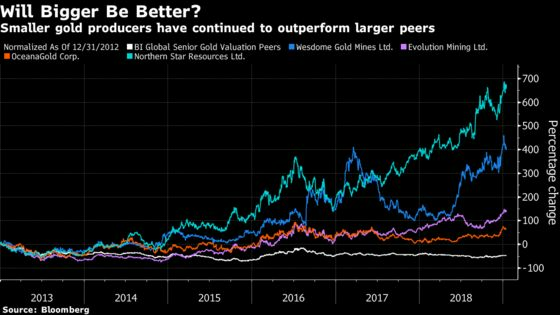 (Bloomberg) -- The $15 billion flurry of deal-making that will super-size the gold industry’s leading producers is no guarantee of better performance, according to an Australian miner who’s been outpacing larger competitors. A surge in deal-making at the start of the decade, including Barrick’s C$7 billion ($5.3 billion) takeover of Equinox Minerals Ltd. in 2011 and Newcrest Mining Ltd.’s $9 billion acquisition of Lihir Gold Ltd. in 2010, resulted in producers later being forced to book major writedowns. 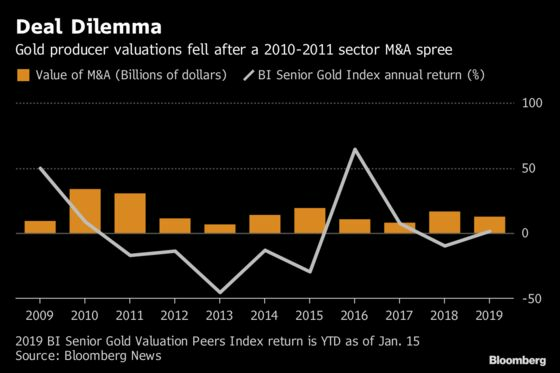 Valuations in the sector tumbled as the gold price cratered through 2015, forcing the industry’s top ranks to sell assets, trim costs and focus on cutting debt. Evolution acquired Barrick’s Cowal mine in Australia in 2015 as the producer sold off some non-core operations, and will examine an expected further round of asset sales as newly-merged companies review their combined portfolios, Klein said. Further deal-making in the gold sector makes sense and would offer producers including Newcrest an opportunity to increase both the scale and diversity of their collection of assets, Citigroup Inc.’s Sydney-based credit specialist Anthony Ip said in a note. Some mid-sized miners could also be tempted to join the rush for deals, said James Wilson, a Perth-based analyst at Argonaut Securities Pty Ltd. “When a million ounce producer can’t find growth options, then perhaps by merging with another one of the mid-tier miners they may see more investment appeal and more of a robust balance sheet,” he said. Developers of new operations may also attract a bout of attention from predators, he said.